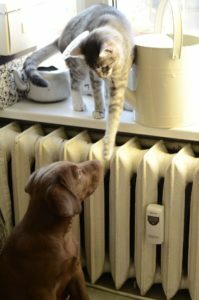 Experienced pet owners know messes are just an inevitable part of living with a beloved animal—whether it’s the chair you just caught your dog lounging in, or a bag of kitty litter your cat just scattered across the floor. Handheld vacuums are useful tools for pet owners, sparing them the trouble of lugging a full-sized vacuum out of the closet for every little mess. Handheld models are also perfect for reaching difficult spots on the stairs, in your car, on top of shelves or any of the myriad strange corners of your home where your pet gets up to. Not all handheld models are built to tackle pet hair, however. The infamous challenge of pet hair requires a special sort of handheld vacuum, and only a select group of models on the market are up to the task. It’s important to research any model you buy beforehand, to make sure it’s up to the task. We looked through the best-selling handheld vacuums and picked our favorite models. In addition to pet hair performance, we looked at factors important in any good vacuum—factors like quality of design, ease of use, and cost. The Eureka RapidClean Step is the follow-up model to the highly popular Eureka EasyClean, with a few great improvements that make the RapidClean a superior cleaning machine. The RapidClean Step is a handheld corded vacuum, designed especially for taking on stairs. It’s great for other surfaces as well, including upholstery, hardwood, and carpet. The Rapid Clean includes a bare floor brush, as well as a brush roll for deep cleaning carpet and upholstery. Eureka adds more power to the RapidClean, with 6 watts compared to the 5.5 watts of its predecessor. It comes with a longer cord, as well (25 feet to the EasyClean’s 20), as well as a 3-foot extendable hose, giving the RapidClean a substantial reach of 28 feet from the outlet. The RapidClean weighs 6 pounds total and features soft “easy roll” wheels that protect the surface of hard floors. Additionally, It also comes with a crevice tool attachment for tight spaces and a washable filter. Eureka backs up this machine with a one-year warranty. The RapidClean is a strong combination of low price and high performance, with great suction and lots of cleaning power. Eureka’s improvements to the EasyClean really shine in the new model, and the RapidClean earns a consistently high rating of 4.4 stars on Amazon. Customers were particularly impressed by the powerful suction generated by the updated motor motor of the RapidClean. The cleaning power of this hand vac pulled embedded dirt and dust from customers’ carpet and upholstery, even picking up debris their previous vacuum had missed. One of the best features of the RapidClean is its multi-floor capabilities. Eureka makes it easy to switch between different surfaces with an on/off brush roll and bare floor brush. To deep clean carpet or upholstery, flip the bare floor brush up and turn the brush roll on. Turn it back off and flip the brush down again to switch back to hardwood or tile. Unlike the EasyClean, the RapidClean isn’t advertised a pet hair vacuum. But reviewers who have owned both models say the newer hand vac actually outperforms its predecessor when it comes to picking up pet hair and dander. The sucking power of the RapidClean retrieves pet hair and dander with ease, even from the deepest carpets. One of the most common complaints about the RapidClean was the filter. Though Eureka advertises the filter as “washable,” the instructions are unclear about how to clean the filter properly. It’s important to note that the filter is ruined if it gets wet (despite the picture on the product page that shows the filter being washed in a sink). Instead, the manual informs owners the filter should be brushed off above a trash can. One reviewer recommended vacuuming the filter (with a different vacuum, of course). Many reviewers suggest buying a few extra replacement filters to maintain peak performance over time. Replacement filters can be found here. Secondly, some reviewers found the RapidClean to be on the heavier side for a handheld vacuum and reported that their arms and wrists became sore after extended use. While others described the unit as “lightweight,” the RapidClean is slightly heavier than the EasyClean by about a pound and a half. The strong suction of the vacuum also may contribute to the sensation of heaviness. If you’re searching for an inexpensive, multi-surface hand vac that does a great job on pet hair, the Eureka RapidClean should be the first model you check out. 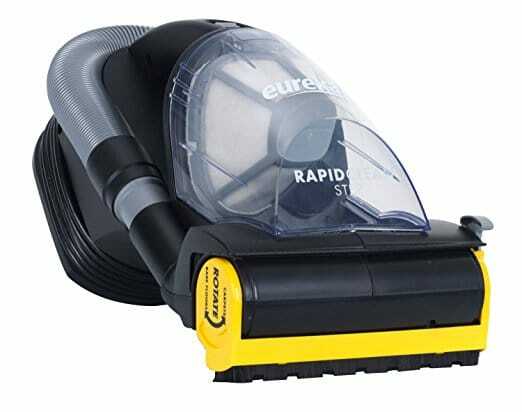 The powerful suction and versatility make the RapidClean a high-performance vacuum sold at a low cost. If top-of-the-line quality is your goal, the Dyson V8 Absolute is perhaps the highest-performing cordless vacuums available right now. The Absolute V8 is the newest member of Dyson’s highly praised V line, with an array of added features that make it perfect for pet owners. The V8 design is essentially a hand vacuum with a detachable floor wand, combining the portability of a handheld vac and the ease of use of an upright model. It’s lightweight, cordless, and the center of gravity near the handle gives the V8 a well-balanced body. The Absolute features a trigger control, as well as a “max power mode” for boosted suction.The Absolute runs on a battery charged via a wall-mounted docking station. The battery holds about 20 minutes of charge, and 6 minutes at a maxpower. 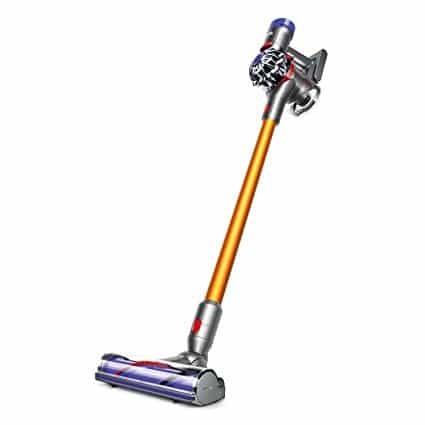 Dyson includes a wide variety of accessories alongside this vacuum to tackle any surface in your home, including two different floor heads for hard floor and carpeting. The “direct driver” head has a brush roll with stiff bristles to drive up dust and dirt imbedded in the carpet. The “soft roller” head features a cleaning roller covered in woven nylon for gentle but effective performance on hard floors. For smaller jobs on upholstery, car interiors, curtains, and the like, there’s the mini-motorized brush tool. Dyson also includes a “combination tool” attachment, which is a dusting brush plus a retractable crevice tool for tight spaces, a mini-dusting brush, and an additional crevice tool. Among vacuums, the Dyson name is synonymous with great performance, and the V8 Absolute expands on this legacy. It’s a versatile and powerful vacuum that’s capable of taking on any conceivable surface in your home. Cordless vacuums often suffer from reduced suction power, but you wouldn’t know it from using the Absolute. The name of the V8 family comes from their muscular V8 motor, and the lifting power of the Absolute rivals many full sized vacuums. Even on the normal power setting, this vacuum picks up both large and small debris. According to a buyer, it works well even in low power mode. The Absolute keeps the top of the line engineering that made the V8 line famous, but adds a few useful accessories that make it the most versatile handheld vac on the market. There are the two floor heads, which allow owners to quickly switch between hard and soft floors. The extension wand can be used on the floor, or to tackle hard to reach spots like the ceiling. It can also be removed to transform the V8 into a more traditional-style handheld vac. Pet owners were particularly fond of the mini-roller brush, which does a great job removing pet hair from upholstery and other fabric. Roughly six inches in size, the attachment features a miniaturized brush roll that handily removes fine dust particles, dander, and pet hair from deep within the fabric. One person with 3 dogs and 1 cat who lived near the ocean says that this product is able to pick up every bit of sand and pet hair, not to mention even the finest dust particles. One of the best improvements Dyson adds to the Absolute is the HEPA filter—a rare feature among handheld vacuums. For pet owners with allergies, vacuums with HEPA stand to greatly improve their quality of life by removing allergens from the air in the home. Emptying the bin is very easy and you are assured that the contents will not waft back to the air. If you have the budget for the V8 Absolute, it’s perhaps the best handheld vacuum available at this time. The superior engineering, elegant design, and top-of-the line accessories make it an unparalleled model among cordless vacuums. Pet owners with allergies will appreciate the HEPA filter and the mini-motorized brush roll. Though it’s by no means a small purchase, the Absolute maintains a 4.6 rating on Amazon—indicating that the majority of people who purchased this vacuum are very happy that they did. Pet owners with allergies will appreciate the HEPA filter and the mini-motorized brush roll. Though it’s by no means a small purchase, the majority of people who purchased this vacuum are very happy that they did. On the other end of the price spectrum lays the BISSELL Pet Hair Eraser—our pick for shoppers looking for a high-quality vacuum that won’t break the bank. The Pet Hair Eraser is currently one of the best selling hand vacuums on Amazon, with thousands of 4 and 5 star ratings— despite its dirt cheap price. 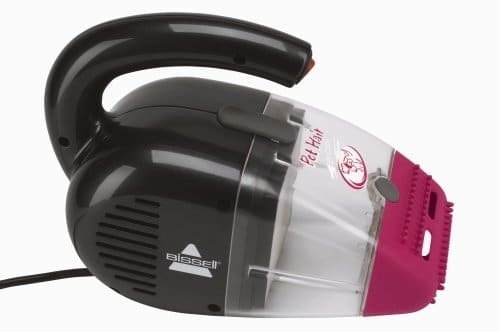 Like many of BISSELL’s vacuums, the Pet Hair Eraser uses an unique design to increase its efficacy without driving up the price. The nozzle of this pet vacuum is made of rubber, which attracts more pet hair into the suction path of the vacuum using static electricity. The Pet Hair Eraser is designed to take especially to take on pet hair on the stairs, upholstery and car interiors. It’s a bagless, corded hand vac model with a 16 foot electrical cord, and it weighs a lightweight 4 pounds. The handle has fingertip on/off controls. It also features multi-level filtration for cleaner exhaust, as well as extra hard nozzle for cleaning up dry messes. BISSELL backs up the Pet Hair Eraser with a one-year warranty. The Pet Hair Eraser produces a lot of suction for such an inexpensive and lightweight hand vac. Reviewers express their surprise at the power behind this model, as well as the vacuum’s effective work on pet hair on a variety of different surfaces. Part of the Pet Hair Eraser’s great pet hair performance is due to the rubberized front attachment. Not only does the static attract more pet hair than a plastic tool, the pliable rubber helps users to reach tight nooks and crannies more easily. The design of the Pet Hair Eraser also meets all the criteria for a solid handheld vacuum—it’s lightweight, small in size, and has a long power cord. The portable body of the hand vac makes it a great tool for quick jobs, sparing you the trouble of pulling your full-sized vacuum from the closet. It’s a great vacuum for cleaning stairs, upholstery, curtains and cat towers. With an extension cord, the Pet Hair Eraser can also make a good car vacuum. When the dust canister is full, it can be easily emptied with the flip of the latch located on top of the vacuum. The HEPA filter is also reusable—users need only to wash out the filter and screen when they become saturated. A number of reviewers pointed to the side exhaust vents on the Pet Hair Eraser as the unit’s biggest downside. A strong blast of air blows from these vents when the vacuum is in operation. Some owners reported that the air scattered nearby dust and debris outside the suction path of the vacuum. It’s also important to note that the Pet Hair Eraser works great on small particles of dirt and dust (and pet hair, of course). This handheld vac is not designed to pick up larger debris, however. A few reviewers damaged their machines by trying to vacuum large particles like sand and kitty litter. For pet owners on a budget, the Pet Hair Eraser is a great buy. For its very low price, the Eraser does an excellent job at picking up pet hair from upholstery and other fabric surface. It’s lightweight, small, and easy to use, with a surprising amount of suction power. Easy to maintain and operate, it’s a good tool for any pet owner to have on hand. With this handy little vacuum, you can easily tackle quick jobs on your furniture, stairs, and car interior. Which is the Best Cordless Portable Vacuum for You? Our top pick is a great balance of performance and price. The inexpensive, multi-surface Eureka RapidClean is designed for the stairs, but does an excellent job on any spot in your home where pet hair can be found. With powerful suction, a mini brush roll, and a bare floor brush, the RapidClean is a great asset for any home with pets. For top-of-the-line quality, you’d be hard-pressed to find a better model than the Dyson V8 Absolute. It’s perhaps the best-designed hand vacuum on the market, and Dyson packs a load of accessories along with it for taking on pet hair, dust, and other debris in any room of your home. If you’re buying on a budget, the BISSELL Pet Hair Eraser is a great choice. This handy little vacuum lives up to its name, making quick work of pet hair on furniture, stairs, and car interiors. It’s lightweight, easy to use, and—best of all—sold at a dirt cheap price. If you’d like to check out competing models on Best Vacuum for Pet Hair , or see what others have to say about our top picks, check out the best vacuums for pet hair on Amazon!